and Stylish star Allu Arjun is set to do a special role in this film. Bunny has already started preparing for his role and is also sporting a stubble for his look. Today he interacted with most of the team members and discussed about the nuances of his role. 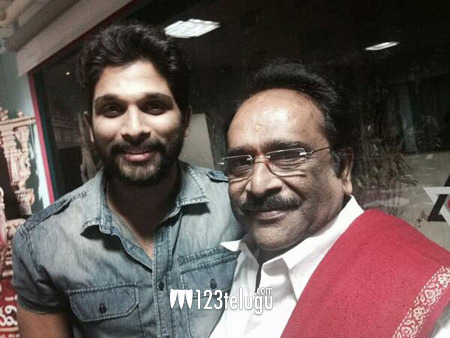 Seen here in the above picture is Bunny with the films writer Paruchuri Gopala Krishna. Anushka plays the lead role in this film which also stars Rana Daggubati is other prominent role. Maestro Illaiyaraaja is scoring the music for this film and the film is in its last leg of its shoot.